Many Rotary Clubs sponsor cycling teams or cycling events and, increasingly, even organise events as fundraisers. Few clubs can boast of having their own team of club member riders who have ridden as a team for close on 20 years. In the process this has involved, at various times, about 30% of the current members of the Rotary Club. 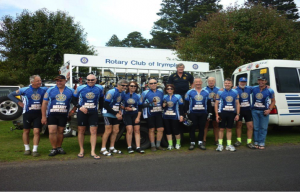 Meet the Irymple “Rotary Revolution” Bike Riding Team! It all started in 1997 when one of our club Rotarians suggested we participate in the “Murray to Moyne.” It would be good to get Rotary away from being seen the “old sedentary men and their fathers” club. So in 1997 we started the legend…and this year the team participates in its 20th consecutive Murray to Moyne event; in the process raising over $60,000 for health related (mainly) local charities. But we didn’t stop at that...in 1999 another relay ride commenced...from Mildura to Echuca...400 kms. The team jumped at this opportunity also and have participated in every event since. We also participate in any local riding events. In fact, such has the “active” team image grown that we have participated as a team in other non-riding events as well...the MS 24 hour Swim-a-thon, the Relay for Life walk and local community triathlons. In 2013 we decided to emulate an event put on by a number of Rotary Districts and ride (all the way) to our Annual Rotary District Conference...that year 5 members rode to Warrnambool over 500 kms, the next year it was Ballarat 440 kms, this year Renmark…and so it goes...each year taking about $1,000 for Australian Rotary Health. The club has had many stalwarts...the current team coordinator riding in his 20th event this year, three others have participated in at least 14 events and let's not forget the bus driver who is up for more than 10 events. Lets face it, we are not elite riders…with an average age of about 60+, we are a little on the slow side by comparison to the “30 to 40 something” lycra clad warrior. We still train every Sunday morning with a ride of between 45 and 60 kms and we have participated in other local events and out-of-town social rides on hybrids and mountain bikes. In 2011, eight members of the team rode all the way from Mildura to Adelaide to celebrate the 65th birthday of one of its founding members. In earlier years we swapped our road bikes for mountain bikes and rode from Broken Hill to Mildura via Menindee and Pooncarrie, we also rode the Mountains to the Murray (Bright/Beechworth to Wangaratta) and East Gippsland Rail Trails! One member even joined the “Great Australian Rotary Bicycle Ride” in 2009 and rode the 4000 km from Darwin to Perth. Some team members are now ageing (well…of course, like quality wine) but hopefully there will always be an influx of new blood and new enthusiasm so that the team will continue to be an inspiration to all men and women of all ages for another 20 years! Rotary Revolution just keeps on going!